ინგლისური ელექტრონული ჯგუფ Depeche Mode-ის დისკოგრაფიაში შედის 14 სტუდიური, 6 საკონცერტო, 10 კომპილაციური და 13 ვიდეო ალბომი, ისევე, როგორც რვა ბოქს-სეტი, 53 სინგლი და 17 მუსიკალური ვიდეო. ჯგუფის მუსიკა გამოდიოდა სხვადასხვა ლეიბლზე - Some Bizzare, Mute Records, Sire Records, Reprise Records და Columbia Records. ჯგუფი ბესილდონში (ესექსი, ინგლისი) 1980 წელს ჩამოყალიბდა. მასში თავდაპირველად შედიოდნენ დეივ გეენი (ვოკალი), მარტინ გორი (კლავიშებიანი საკრავები, გიტარა, ვოკალი, 1981 წლიდან სიმღერების ავტორი), ენდი ფლეტჩერი (კლავიშებიანი საკრავები) და ვინს კლარკი (კლავიშებიანი საკრავები, სიმღერების ავტორი 1980–81 წელს). ვინს კლარკმა ჯგუფი 1981 წლის სადებიუტო Speak & Spell-ის შემდეგ დატოვა და მისი ადგილი ალან უაილდერმა დაიკავა (პროდიუსერი, კლავიშებიანი საკრავები, დასარტყმელი საკრავები), რომელიც ჯგუფში 1995 წლამდე დარჩა. უაილდერის წასვლის შემდეგ გეენი, გორი და ფლეტჩერი ტრიოდ იქცნენ. 1981 წელს დებიუტის შემდეგ ჯგუფის 48 სინგლი ბრიტანეთის სინგლების ჩარტში მოხვდა. ლეიბლის თანახმად, Depeche Mode-ს მსოფლიოში 100 მილიონზე მეტი ჩანაწერი აქვს გაყიდული. ჯგუფის საკონცერტო ვიდეო Devotional ნომინირებული იქნა გრემიზე 1995 წელს საუკეთესო სრულმეტრაჟიანი მუსიკალური ვიდეოს კატეგორიაში. "Suffer Well", ალბომის Playing the Angel მესამე სინგლი ნომინირებული იყო გრემიზე კატეგორიაში „საუკეთესო საცეკვაო ჩანაწერი“. 2006 წლის 19 დეკემბერს ჯგუფის სრული კატალოგი გამოიცა iTunes Store-ზე, როგორც The Complete Depeche Mode. 2009 წლის 3 დეკემბერს Sounds of the Universe ნომინირებული იქნა გრემის ჯილდოზე საუკეთესო ალტერნატიული ალბომის კატეგორიაში. გრემის 52-ე დაჯილდოებაზე "Wrong"-მა მიიღო ჯგუფის ისტორიაში მეორე ნომინაცია ვიდეოების კატეგორიაში - როგორც საუკეთესო მოკლე ვიდეომ. "Leave in Silence"-ით დაწყებული, ჯგუფის ევროპული სინგლების უმეტესობა ქრონოლოგიურად არის დანომრილი ნომრით, რომელსაც ახლავს სიტყვა „BONG“. მაგალითად, მეხუთე სინგლი "People are People"-ის ნომერი არის BONG5, დაბეჭდილი სინგლის გარეკანზე, გვერდზე და თავად გრამფირფიტაზე ან CD-ზე. „BONG“-ს წინ ახლავს ციფრები ან ასოები, რომლებიც აღნიშნავენ გამოცემის ფორმატს, მაგალითად - "7" ნიშნავს 7" სინგლს, "CD" – CD სინგლს, "i" – მხოლოდ iTunes-ზე გამოცემულ სინგლს. დამატებითი ასოები, მაგალითად L ან XL, აღნიშნავენ იმას, რომ გამოცემა შეზღუდულია. პრომო-გამოცემებს ახლავს ასო P. მაგალითად, „Suffer Well“-ის PL12BONG37 ნიშნავს, რომ გამოცემა არის შეზღუდული, მხოლოდ პრომო, 12" ფორმატის. თუმცა, ეს სქემა შეიცვალა მხოლოდ სინგლ „Little 15“-ის შემთხვევაში და მასზე ეწერა „12 LITTLE 15“ (BONG-ის გამოყენების სანაცვლოდ). ჯგუფის პირველ ხუთ სინგლზე BONG არ ეწერა და მითითებული იყო Mute Records-ის შემოკლება MUTE. Depeche Mode BONG-ს იყენებდა Mute Records-იდან 2011 წლის შემდეგ წასვლამდე. არაბრიტანული სინგლები (მაგალითად, „Strangelove '88“), რომლებიც არ იყო აღნიშნული BONG-ით, მოცემული სიიდან ამოღებულია. ↑ 1.0 1.1 Recording the Angel და Recording the Universe გამოიცა, როგორც ალბომების სერიები, ჩაწერილი ტურნეების Touring the Angel და Tour of the Universe ფარგლებში. ↑ The Singles 81→85 პირველად ჩარტში 1999 წლის თებერვალში მოხვდა, სახელწოდებით The Singles 81>85. ↑ "Dreaming of Me" პირველად ჩარტში მოხვდა გერმანიაში, 2011 წელს. ↑ ნიდერლანდებში "Love, in Itself" ჩარტში მოხვდა, როგორც EP და ალბომების ჩარტში #1 პოზიციაზე იმყოფებოდა. ↑ "Shake the Disease" ჩარტში Hot Dance Club Songs არ მოხვედრილა, მაგრამ ჩარტში Dance/Electronic Singles Sales #33 პოზიციამდე ავიდა. ↑ აშშ-ში "But Not Tonight" გამოვიდა, როგორც A-მხარე, სინგლზე "Stripped", ფილმის „თანამედროვე გოგონები“ სარეკლამო მიზნით. ↑ "A Question of Time" ჩარტში Hot Dance Club Songs არ მოხვედრილა, მაგრამ #34-ე პოზიციამდე მიაღწია Dance/Electronic Singles Sales-ში. ↑ 9.0 9.1 აშშ-ში "Behind the Wheel" და "Route 66" ჩარტში ერთად მოხვდნენ. ↑ ავსტრალიაში "Route 66" 1988 წლის მაისში ჩარტში A-მხარის სახით მოხვდა, ხოლო "Behind the Wheel" იყო B-მხარე. ↑ "Goodnight Lovers" ბრიტანეთის ჩარტში არ მოხვედრილა, ვინაიდან იმ პერიოდში ჩარტში არ შედიოდნენ სინგლები, რომლებზეც ჩაწერილი იყო ოთხ სიმღერაზე მეტი. თუმცა, იგი მოხვდა ბრიტანეთის „ბიუჯეტური ალბომების ჩარტში“. ↑ პირველად ჩარტში - დეკემბერი 2004.
დისკოგრაფია. DepecheMode.com. წაკითხვის თარიღი: 30 ნოემბერი 2013. ↑ "New Depeche Mode-ის ალბომი number one in 20 countries Archived 27 July 2011 საიტზე Wayback Machine. 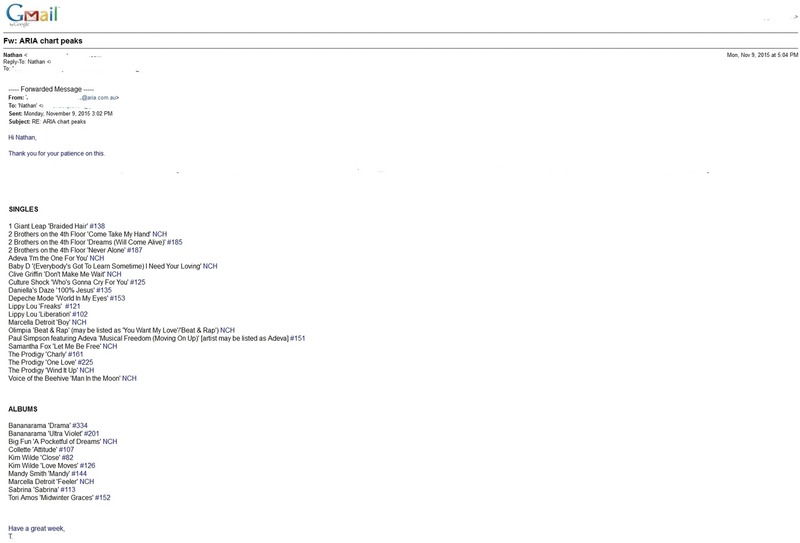 ", EMI Music.com. 1 მაისი 2009. ↑ 37th Grammy Awards - 1995. RockOnTheNet.com. წაკითხვის თარიღი: 2009-02-24. Official Charts > Depeche Mode. ოფიციალური ბრიტანეთის ჩარტების კომპანია. წაკითხვის თარიღი: 8 აპრილი 2017. (2006) British Hit Singles & Albums, 19th, HIT Entertainment. ISBN 1-904994-10-5. Top 100 (Kent Music Report) peaks to 19 ივნისი 1988: კენტი, დევიდ (1993). Australian Chart Book 1970–1992, Illustrated, St. Ives, N.S.W. : Australian Chart Book, გვ. 88. ISBN 0-646-11917-6. Kent Report-ის ჩარტი ARIA-ს ლიცენზიას 1983 წლის შუა პერიოდიდან 1988 წლის 19 ივნისამდე ფლობდა. Top 50: australian-charts.com > Depeche Mode in Australian Charts. Hung Medien. წაკითხვის თარიღი: 29 ივლისი 2015. Top 100 1990 წლის იანვრიდან 2010 წლის დეკემბრამდე: Ryan, Gavin (2011). Australia's Music Charts 1988–2010. Mt. Martha, VIC, Australia: Moonlight Publishing. "Everything Counts (საკონცერტო)", "Personal Jesus", "Policy of Truth", "Home", "Useless", "Dream On", "Enjoy the Silence '04", "Precious", "A Pain That I'm Used To", "Suffer Well" და "Martyr": Response from ARIA re: chart inquiry, received 5 ივნისი 2015. Imgur.com. დაარქივებულია ორიგინალიდან - 5 ივნისი 2015. წაკითხვის თარიღი: 17 ოქტომბერი 2015. "World In My Eyes": Response from ARIA re: chart inquiry, received 9 ნოემბერი 2015. Imgur.com. დაარქივებულია ორიგინალიდან - 9 ნოემბერი 2015. წაკითხვის თარიღი: 9 ნოემბერი 2015. 101 და The Singles 81→85: Response from ARIA re: chart inquiry, received 17 თებერვალი 2016. Imgur.com. წაკითხვის თარიღი: 17 თებერვალი 2016. "Goodnight Lovers": Response from ARIA re: chart inquiry, received 12 ივლისი 2016. Imgur.com. წაკითხვის თარიღი: 12 ივლისი 2016. ↑ 5.0 5.1 5.2 5.3 5.4 Discographie Depeche Mode გერმანული. austriancharts.at. Hung Medien. დაარქივებულია ორიგინალიდან - 25 აპრილი 2008. წაკითხვის თარიღი: 27 ოქტომბერი 2007. ↑ 6.0 6.1 6.2 Discographie Depeche Mode French. lescharts.com. Hung Medien. წაკითხვის თარიღი: 19 ნოემბერი 2010. Chartverfolgung / Depeche Mode / Longplay. musicline.de. Media Control Charts. წაკითხვის თარიღი: 19 ნოემბერი 2010. German chart positions ('Quicksearch'-ის ძიებაში არჩეული უნდა იქნას პარამეტრი "Depeche Mode"). Charts-Surfer.de. დაარქივებულია ორიგინალიდან - 12 ოქტომბერი 2007. წაკითხვის თარიღი: 27 ოქტომბერი 2007. ↑ 8.0 8.1 8.2 Discography Depeche Mode. italiancharts.com. Hung Medien. წაკითხვის თარიღი: 4 ნოემბერი 2013. ↑ 9.0 9.1 9.2 9.3 Discografie Depeche Mode ჰოლანდიურად. dutchcharts.nl. Hung Medien. დაარქივებულია ორიგინალიდან - 3 დეკემბერი 2013. წაკითხვის თარიღი: 8 ნოემბერი 2013. ↑ 10.0 10.1 10.2 10.3 10.4 10.5 Discography Depeche Mode. swedishcharts.com. Hung Medien. წაკითხვის თარიღი: 4 ნოემბერი 2013. ↑ 11.0 11.1 11.2 11.3 11.4 11.5 11.6 Discographie Depeche Mode გერმანული. swisscharts.com. Hung Medien. დაარქივებულია ორიგინალიდან - 13 თებერვალი 2010. წაკითხვის თარიღი: 4 ნოემბერი 2013. ↑ 12.0 12.1 12.2 Depeche Mode – Chart History: Billboard 200. Billboard. Prometheus Global Media. წაკითხვის თარიღი: 4 ნოემბერი 2013. ↑ Speak And Spell. DepecheMode.com. წაკითხვის თარიღი: 8 ნოემბერი 2013. ↑ 14.00 14.01 14.02 14.03 14.04 14.05 14.06 14.07 14.08 14.09 14.10 14.11 14.12 14.13 14.14 14.15 14.16 14.17 14.18 14.19 14.20 14.21 Certified Awards Search (შესასვლელად გამოიყენეთ საძიებო სიტყვა "Depeche Mode"). ბრიტანეთის ფონოგრამების მწარმოებლების ასოციაცია. წაკითხვის თარიღი: 4 ნოემბერი 2013. ↑ 15.00 15.01 15.02 15.03 15.04 15.05 15.06 15.07 15.08 15.09 15.10 15.11 15.12 15.13 15.14 15.15 15.16 15.17 15.18 15.19 15.20 15.21 15.22 15.23 15.24 Gold–/Platin-Datenbank (Depeche Mode) გერმანული. Bundesverband Musikindustrie. წაკითხვის თარიღი: 12 აპრილი 2013. ↑ 16.0 16.1 16.2 16.3 16.4 16.5 16.6 Guld & Platina – År 1987–1998 Swedish (PDF). International Federation of the Phonographic Industry of Sweden. დაარქივებულია ორიგინალიდან - 21 მაისი 2012. წაკითხვის თარიღი: 30 ნოემბერი 2013. ↑ A Broken Frame. DepecheMode.com. წაკითხვის თარიღი: 8 ნოემბერი 2013. ↑ Construction Time Again. DepecheMode.com. წაკითხვის თარიღი: 8 ნოემბერი 2013. ↑ Some Great Reward. DepecheMode.com. წაკითხვის თარიღი: 8 ნოემბერი 2013. ↑ 20.00 20.01 20.02 20.03 20.04 20.05 20.06 20.07 20.08 20.09 20.10 20.11 20.12 20.13 20.14 20.15 20.16 20.17 20.18 20.19 20.20 Gold & Platinum: Depeche Mode. Recording Industry Association of America. წაკითხვის თარიღი: 8 ნოემბერი 2013. ↑ Black Celebration. DepecheMode.com. წაკითხვის თარიღი: 8 ნოემბერი 2013. ↑ 22.0 22.1 22.2 22.3 22.4 Les Ventes & Les Certifications: Depeche Mode French (აირჩიეთ "DEPECHEMODE", შემდეგ "OK"). InfoDisc. დაარქივებულია ორიგინალიდან - 13 ივლისი 2012. წაკითხვის თარიღი: 8 ნოემბერი 2013. ↑ Music For The Masses. DepecheMode.com. წაკითხვის თარიღი: 8 ნოემბერი 2013. ↑ Violator. DepecheMode.com. წაკითხვის თარიღი: 8 ნოემბერი 2013. ↑ 25.0 25.1 FIMI - Certificazioni. Federazione Industria Musicale Italiana. წაკითხვის თარიღი: 3 აპრილი 2017. ↑ 27.0 27.1 27.2 27.3 27.4 27.5 27.6 27.7 The Official Swiss Charts and Music Community: Awards (Depeche Mode) გერმანული. swisscharts.com. Hung Medien. წაკითხვის თარიღი: 8 ნოემბერი 2013. ↑ Songs Of Faith And Devotion. DepecheMode.com. წაკითხვის თარიღი: 8 ნოემბერი 2013. ↑ Ultra. DepecheMode.com. წაკითხვის თარიღი: 8 ნოემბერი 2013. ↑ Certifications Albums Or – année 1997 French. Syndicat National de l'Édition Phonographique. წაკითხვის თარიღი: 8 ნოემბერი 2013. ↑ Exciter. DepecheMode.com. წაკითხვის თარიღი: 8 ნოემბერი 2013. ↑ Guld & Platina – År 2001 Swedish (PDF). International Federation of the Phonographic Industry of Sweden (8 მაისი 2001). დაარქივებულია ორიგინალიდან - 16 ივნისი 2011. წაკითხვის თარიღი: 22 თებერვალი 2013. ↑ Certifications Albums Or – année 2001 French. Syndicat National de l'Édition Phonographique. დაარქივებულია ორიგინალიდან - 3 დეკემბერი 2013. წაკითხვის თარიღი: 8 ნოემბერი 2013. ↑ Playing The Angel. DepecheMode.com. წაკითხვის თარიღი: 8 ნოემბერი 2013. ↑ Guld & Platina – År 2005 Swedish (PDF). International Federation of the Phonographic Industry of Sweden (18 ნოემბერი 2005). დაარქივებულია ორიგინალიდან - 16 ივნისი 2011. წაკითხვის თარიღი: 21 მარტი 2011. ↑ Certifications Albums Platine – année 2006 French. Syndicat National de l'Édition Phonographique. დაარქივებულია ორიგინალიდან - 13 ოქტომბერი 2013. წაკითხვის თარიღი: 8 ნოემბერი 2013. ↑ Sounds Of The Universe. DepecheMode.com. წაკითხვის თარიღი: 8 ნოემბერი 2013. ↑ Certificazioni Italian (select "Album e Compilation" in the field "Scegli la sezione", select Week 24 and Year 2009, enter "Depeche Mode" in the field "Artista", then click "Avvia la ricerca"). Federazione Industria Musicale Italiana. დაარქივებულია ორიგინალიდან - 6 ოქტომბერი 2014. წაკითხვის თარიღი: 9 სექტემბერი 2013. ↑ Guld & Platina – År 2009 Swedish (PDF). International Federation of the Phonographic Industry of Sweden (29 აპრილი 2009). დაარქივებულია ორიგინალიდან - 16 ივნისი 2011. ↑ Certifications Albums Platine – année 2009 French. Syndicat National de l'Édition Phonographique. დაარქივებულია ორიგინალიდან - 26 სექტემბერი 2012. წაკითხვის თარიღი: 8 ნოემბერი 2013. ↑ Delta Machine. DepecheMode.com. წაკითხვის თარიღი: 8 ნოემბერი 2013. ↑ Certificazioni Italian (select "Album e Compilation" in the field "Scegli la sezione", select Week 35 and Year 2013, enter "Depeche Mode" in the field "Artista", then click "Avvia la ricerca"). Federazione Industria Musicale Italiana. დაარქივებულია ორიგინალიდან - 6 ოქტომბერი 2014. წაკითხვის თარიღი: 9 სექტემბერი 2013. ↑ Veckolista Album – Vecka 15, 12 აპრილი 2013 Swedish. Swedish Recording Industry Association. წაკითხვის თარიღი: 12 აპრილი 2013. ↑ Certifications Albums – Année 2013. Syndicat National de l'Édition Phonographique. წაკითხვის თარიღი: 1 მარტი 2014. ↑ Le Top de la semaine : Top Albums - SNEP (Week 12, 2017) French. Syndicat National de l'Édition Phonographique. წაკითხვის თარიღი: 28 მარტი 2017. ↑ Albums - SNEP. Syndicat National de l'Édition Phonographique. წაკითხვის თარიღი: 13 აპრილი 2017. ↑ 101. DepecheMode.com. წაკითხვის თარიღი: 8 ნოემბერი 2013. ↑ Recording the Angel 2006. DepecheMode.com. დაარქივებულია ორიგინალიდან - 29 დეკემბერი 2010. წაკითხვის თარიღი: 8 ნოემბერი 2013. ↑ Touring The Angel: Live In Milan. DepecheMode.com. წაკითხვის თარიღი: 8 ნოემბერი 2013. ↑ Recording the Universe 2009. DepecheMode.com. დაარქივებულია ორიგინალიდან - 4 მარტი 2011. წაკითხვის თარიღი: 8 ნოემბერი 2013. ↑ Tour Of The Universe : Barcelona 20/21.11.09. DepecheMode.com. წაკითხვის თარიღი: 8 ნოემბერი 2013. ↑ Certificazioni Italian (select "Album e Compilation" in the field "Scegli la sezione", select Week 48 and Year 2011, enter "Depeche Mode" in the field "Artista", then click "Avvia la ricerca"). Federazione Industria Musicale Italiana. დაარქივებულია ორიგინალიდან - 6 ოქტომბერი 2014. წაკითხვის თარიღი: 9 სექტემბერი 2013. ↑ 53.0 53.1 Depeche Mode Live In Berlin – Coming ნოემბერი 17th on Columbia Records. DepecheMode.com. წაკითხვის თარიღი: 21 დეკემბერი 2014. ↑ People Are People. DepecheMode.com. წაკითხვის თარიღი: 8 ნოემბერი 2013. ↑ The Singles 81–85. DepecheMode.com. წაკითხვის თარიღი: 8 ნოემბერი 2013. ↑ Catching Up With Depeche Mode. DepecheMode.com. წაკითხვის თარიღი: 8 ნოემბერი 2013. ↑ Depeche Mode: Greatest Hits გერმანული. Amazon.de. წაკითხვის თარიღი: 8 ნოემბერი 2013. ↑ The Singles 86>98. DepecheMode.com. წაკითხვის თარიღი: 8 ნოემბერი 2013. ↑ Certifications Albums Double Or – année 2001 French. Syndicat National de l'Édition Phonographique. დაარქივებულია ორიგინალიდან - 26 სექტემბერი 2012. წაკითხვის თარიღი: 8 ნოემბერი 2013. ↑ The Singles 81–98. Amazon.co.uk. წაკითხვის თარიღი: 8 ნოემბერი 2013. ↑ Certificazioni Italian (select "Album e Compilation" in the field "Scegli la sezione", select Week 51 and Year 2012, enter "Depeche Mode" in the field "Artista", then click "Avvia la ricerca"). Federazione Industria Musicale Italiana. დაარქივებულია ორიგინალიდან - 6 ოქტომბერი 2014. წაკითხვის თარიღი: 9 სექტემბერი 2013. ↑ Remixes 81–04. DepecheMode.com. წაკითხვის თარიღი: 8 ნოემბერი 2013. ↑ Certifications Albums Double Or – année 2005 French. Syndicat National de l'Édition Phonographique. დაარქივებულია ორიგინალიდან - 23 სექტემბერი 2012. წაკითხვის თარიღი: 8 ნოემბერი 2013. ↑ The Best Of Depeche Mode, Volume 1. DepecheMode.com. წაკითხვის თარიღი: 8 ნოემბერი 2013. ↑ Certificazioni Italian (select "Album e Compilation" in the field "Scegli la sezione", select Week 4 and Year 2012, enter "Depeche Mode" in the field "Artista", then click "Avvia la ricerca"). Federazione Industria Musicale Italiana. დაარქივებულია ორიგინალიდან - 6 ოქტომბერი 2014. წაკითხვის თარიღი: 9 სექტემბერი 2013. ↑ Certifications Albums Double Or – année 2006 French. Syndicat National de l'Édition Phonographique. დაარქივებულია ორიგინალიდან - 24 სექტემბერი 2012. წაკითხვის თარიღი: 11 იანვარი 2014. ↑ The Complete Depeche Mode – Depeche Mode. AllMusic. Rovi Corporation. წაკითხვის თარიღი: 8 ნოემბერი 2013. ↑ Remixes 2: 81-11. DepecheMode.com. წაკითხვის თარიღი: 8 ნოემბერი 2013. ↑ The World We Live In And Live In Hamburg. DepecheMode.com. წაკითხვის თარიღი: 30 ნოემბერი 2013. ↑ Some Great Videos. DepecheMode.com. წაკითხვის თარიღი: 30 ნოემბერი 2013. ↑ Strange. DepecheMode.com. წაკითხვის თარიღი: 30 ნოემბერი 2013. ↑ 101. DepecheMode.com. წაკითხვის თარიღი: 30 ნოემბერი 2013. ↑ Strange Too. DepecheMode.com. წაკითხვის თარიღი: 30 ნოემბერი 2013. ↑ Devotional. DepecheMode.com. წაკითხვის თარიღი: 30 ნოემბერი 2013. ↑ The Videos 86>98. DepecheMode.com. წაკითხვის თარიღი: 30 ნოემბერი 2013. ↑ Depeche Mode Some Great Videos 81>85 (Pal System) (1998). Amazon.com. წაკითხვის თარიღი: 30 ნოემბერი 2013. ↑ One Night In Paris. DepecheMode.com. წაკითხვის თარიღი: 30 ნოემბერი 2013. ↑ The Videos 86>98+. DepecheMode.com. წაკითხვის თარიღი: 30 ნოემბერი 2013. ↑ Touring The Angel: Live In Milan. DepecheMode.com. წაკითხვის თარიღი: 30 ნოემბერი 2013. ↑ The Best Of Depeche Mode: Volume 1. DepecheMode.com. წაკითხვის თარიღი: 30 ნოემბერი 2013. ↑ Tour Of The Universe : Barcelona 20/21.11.09. DepecheMode.com. წაკითხვის თარიღი: 30 ნოემბერი 2013. Discographie Depeche Mode French. lescharts.com. Hung Medien. წაკითხვის თარიღი: 19 ნოემბერი 2010. Tous les Titres de chaque Artiste – Depeche Mode French. InfoDisc. დაარქივებულია ორიგინალიდან - 14 ივნისი 2012. წაკითხვის თარიღი: 4 ნოემბერი 2013. 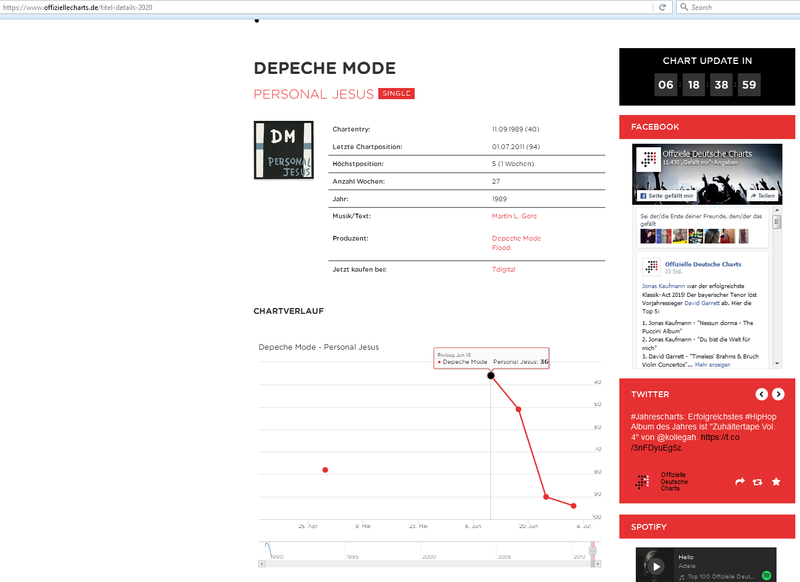 All peaks other than "Personal Jesus 2011": Offizielle Deutsche Charts > Search results for Depeche Mode (singles) გერმანული. GfK Entertainment. წაკითხვის თარიღი: 8 იანვარი 2016. "Personal Jesus 2011": Depeche Mode - Personal Jesus (single) გერმანული. GfK Entertainment. წაკითხვის თარიღი: 8 იანვარი 2016. [artist=Depeche+Mode The Irish Charts – All there is to know > Search results for Depeche Mode]. Fireball Media. წაკითხვის თარიღი: 8 აპრილი 2017. Discography Depeche Mode. irish-charts.com. Hung Medien. წაკითხვის თარიღი: 4 ნოემბერი 2013. N.B. This site only displays peaks commencing in 2001. ↑ 85.0 85.1 85.2 85.3 Indice per Interprete: D Italian. Hit Parade Italia. წაკითხვის თარიღი: 4 ნოემბერი 2013.
ყველა, გარდა სიმღერების "Strangelove" და "It's No Good": Depeche Mode – Chart History: Hot 100. Billboard. Prometheus Global Media. წაკითხვის თარიღი: 4 ნოემბერი 2013. "Strangelove": Billboard > The Hot 100 > The week of აგვისტო 22, 1987. Prometheus Global Media. წაკითხვის თარიღი: 26 იანვარი 2016. N.B. 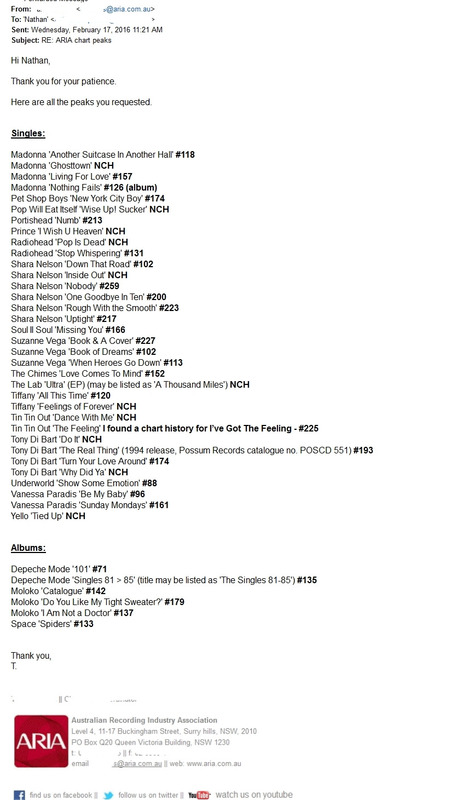 The Depeche Mode Hot 100 Chart History page combines the chart run for "Strangelove" with "Strangelove '88", so only the higher peak of the two is listed. "It's No Good": Billboard > The Hot 100 > The week of ივნისი 7, 1997. Prometheus Global Media. წაკითხვის თარიღი: 26 იანვარი 2016. N.B. The Depeche Mode Hot 100 Chart History page erroneously lists the peak for "It's No Good" as #43. Depeche Mode – Chart History: Dance Club Songs. Billboard. Prometheus Global Media. წაკითხვის თარიღი: 4 ნოემბერი 2013. Depeche Mode – Awards (Billboard Singles). AllMusic. Rovi Corporation. წაკითხვის თარიღი: 8 ნოემბერი 2013. Pre-1997: Pennanen, Timo (2006). Sisältää hitin - levyt ja esittäjät Suomen musiikkilistoilla vuodesta 1972, 1st (fi), Helsinki: Tammi. ISBN 978-951-1-21053-5. From 1997: Discography Depeche Mode. finnishcharts.com. Hung Medien. დაარქივებულია ორიგინალიდან - 3 დეკემბერი 2013. წაკითხვის თარიღი: 4 ნოემბერი 2013. Salaverri, Fernando (2005). Sólo éxitos: año a año, 1959–2002, პირველი, Fundación Autor-SGAE. ISBN 84-8048-639-2. Search for: Depeche Mode (Songs). spanishcharts.com. Hung Medien. წაკითხვის თარიღი: 8 ნოემბერი 2013. ↑ 90.0 90.1 90.2 Depeche Mode – Chart History: Alternative Songs. Billboard. Prometheus Global Media. წაკითხვის თარიღი: 4 ნოემბერი 2013. ↑ 92.0 92.1 Zywietz, Tobias. Chart Log UK: Asher D – Dyverse. zobbel.de. დაარქივებულია ორიგინალიდან - 19 ოქტომბერი 2015. წაკითხვის თარიღი: 8 ნოემბერი 2013. "Dreaming of Me": Depeche Mode – Dreaming of Me (single) გერმანული. GfK Entertainment. წაკითხვის თარიღი: 8 აპრილი 2017. "Personal Jesus 2011": Depeche Mode - Personal Jesus (single) გერმანული. Imgur.com. წაკითხვის თარიღი: 8 იანვარი 2016. "Heaven": Depeche Mode – Heaven (single) გერმანული. GfK Entertainment. წაკითხვის თარიღი: 8 აპრილი 2017. "All That's Mine": Depeche Mode – All That's Mine (single) გერმანული. GfK Entertainment. წაკითხვის თარიღი: 8 აპრილი 2017. "Soothe My Soul": Depeche Mode – Soothe My Soul (single) გერმანული. GfK Entertainment. წაკითხვის თარიღი: 8 აპრილი 2017. "Should Be Higher": Depeche Mode – Should Be Higher (single) გერმანული. GfK Entertainment. წაკითხვის თარიღი: 8 აპრილი 2017. "Where's the Revolution": Depeche Mode – Where's the Revolution (single) გერმანული. GfK Entertainment. წაკითხვის თარიღი: 8 აპრილი 2017. "Personal Jesus 2011": Single (track) Top 10 lista (2011.05.30. – 2011.06.05.) Hungarian (select "Single (track) Top 10 lista" from the Lista drop-down list, select "2011" from the Év drop-down list, select "22" from the Hét drop-down list, then click "Keresés"). Magyar Hanglemezkiadók Szövetsége. წაკითხვის თარიღი: 8 ნოემბერი 2013. "Heaven": Single (track) Top 10 lista (2013.02.04. – 2013.02.10.) Hungarian (select "Single (track) Top 10 lista" from the Lista drop-down list, select "2013" from the Év drop-down list, select "6" from the Hét drop-down list, then click "Keresés"). Magyar Hanglemezkiadók Szövetsége. წაკითხვის თარიღი: 8 ნოემბერი 2013. "Soothe My Soul": Single (track) Top 10 lista (2013.05.13. – 2013.05.19.) Hungarian (select "Single (track) Top 10 lista" from the Lista drop-down list, select "2013" from the Év drop-down list, select "20" from the Hét drop-down list, then click "Keresés"). Magyar Hanglemezkiadók Szövetsége. წაკითხვის თარიღი: 8 ნოემბერი 2013. "Should Be Higher": Single (track) Top 10 lista (2013.10.14. – 2013.10.20.) Hungarian (select "Single (track) Top 10 lista" from the Lista drop-down list, select "2013" from the Év drop-down list, select "42" from the Hét drop-down list, then click "Keresés"). Magyar Hanglemezkiadók Szövetsége. წაკითხვის თარიღი: 8 ნოემბერი 2013. ↑ Certificazioni Italian (select "Online" in the field "Scegli la sezione", select Week 22 and Year 2013, enter "Depeche Mode" in the field "Artista", then click "Avvia la ricerca"). Federazione Industria Musicale Italiana. დაარქივებულია ორიგინალიდან - 6 ოქტომბერი 2014. წაკითხვის თარიღი: 9 სექტემბერი 2013. ↑ Hungarian Single TOP 40. ↑ Discografie Depeche Mode ჰოლანდიურად. ultratop.be. Hung Medien. წაკითხვის თარიღი: 4 აგვისტო 2014. ↑ Discographie Depeche Mode French. ultratop.be. Hung Medien. წაკითხვის თარიღი: 4 აგვისტო 2014. ↑ Video / Music Videos (select individual video links for information). DepecheMode.com. წაკითხვის თარიღი: 30 ნოემბერი 2013. ↑ Some Bizzare Album – Various Artists. AllMusic. Rovi Corporation. წაკითხვის თარიღი: 30 ნოემბერი 2013. ↑ Mason, Stewart. Earth Girls Are Easy [Original Soundtrack – Original Soundtrack]. AllMusic. Rovi Corporation. წაკითხვის თარიღი: 30 ნოემბერი 2013. ↑ Until the End of the World – Original Soundtrack. AllMusic. Rovi Corporation. წაკითხვის თარიღი: 30 ნოემბერი 2013. ↑ Depeche Mode Get Sims(ulated). IGN (3 მარტი 2006). წაკითხვის თარიღი: 30 ნოემბერი 2013. ↑ Collar, Matt. (Ahk-Toong Bay-Bi) Covered – Various Artists. AllMusic. Rovi Corporation. წაკითხვის თარიღი: 30 ნოემბერი 2013.
ეს გვერდი ბოლოს დარედაქტირდა: 17:30, 9 ივლისი 2018.